1. The pilots don’t look like they can support the axle load, why? 2. Why do stud-piloted front hubs come with two different stud sizes? The standard sizes are 1-1/8 inch and 3⁄4-inch studs. The larger studs were created to give the same outer wheel nut as used on the drive hub. The 3⁄4” stud uses a different nut than the drive hubs but the same installation socket. The reason the smaller studs are used is to save weight. 3. I have a stud-piloted wheel. Does it work for both 3/4-inch and 1-1/8 inch studs used on front hubs? Yes. For the 1-1/8 inch stud, the same nut can be used as for the outer wheel of a drive or trailer hub dual-wheel application. A different, unique nut is used for the 3/4 inch stud. 4. Can I convert my stud-piloted hub to a hub-piloted hub? Stud-piloted front hubs can be converted to hub-piloted hubs only if they originally came with “convertible” 3⁄4-inch studs, which have the same diameter shank as the studs for the hub-piloted configuration. When converting, verify the drum pilot diameter on your hub matches the pilot diameter needed for the drum you will use. The current standard drum pilot diameter is 8.78 inches. Verify there is a wheel pilot on the hub beyond the drum pilot. Contact ConMet Customer Service at 800-547-9473, if you require assistance determining the drum pilot diameter on the hub. Contact your drum manufacturer for their pilot diameter. 5. Do I have to service my hubs? When and how? ConMet service manual 10041406 describes the recommended maintenance and service for all ConMet hubs. To avoid costly downtime and repair and keep your hubs running at peak performance, pre-trip inspections, post-trip inspections, preventative maintenance, and service at various intervals are recommended. 6. I have a Q-spindle drive hub. What is the replacement? ConMet no longer manufacturers Q-spindle drive hubs or an equivalent replacement. Contact your dealer for replacement options. 7. Can I take the spacer out of my PreSet hub? Yes, if you are willing to convert to a manual-set bearing configuration. The spacer is required to properly space the bearings of a PreSet hub. It is clamped between the two bearing cones with a high spindle nut torque. Once removed, the hub can be used by setting the bearing endplay manually as you would any other hub. 8. My hub is aluminum. It’s a ConMet hub right? Not necessarily. There are some other manufacturers that make or have made aluminum hubs. Check for a ConMet logo cast into the hub, or verify the part numbers stamped or cast into the hub with ConMet Customer Service at 800-547-9473, to be sure. 9. I have a spun bearing cup in my front hub. What causes this? Axle overloading is the most common cause, but a low lubricant condition can also cause this. 10. I have a ConMet front hub for an inboard-mounted brake drum. Is there a replacement? ConMet hubs with a 6.12″ flange offset for use with an inboard-mounted drum (drums mounted to the inside of the hub flange) can be replaced with a hub having a 5.44″ flange offset and an outboard-mounted drum. LMS, or “Low Maintenance System”, is a Dana designation for a series of products designed for low maintenance. ConMet manufactures some hubs used by Dana under this designation. Consult Dana for warranty, service, and maintenance for LMS hubs. The hubs are usually identified by a yellow ring present in the spindle nut assembly or they may be identified by an LMS hubcap. 12. What lubricant should I use in my hubs? For PreSet hubs, contact either your OEM or review the Lubricant Compatibility Listing document 10009945 for an approved lubricant list based on seal compatibility. Refer to ConMet service manual 10041406 for recommended filling practices. For non-PreSet hubs, consult your trailer or tractor OEM for approved lubricants and filling recommendations. 13. I can’t find replacement parts for my PreSet hub. What do I do? ConMet sells parts kits for each PreSet hub type. See ConMet service manual 10041406 for a complete parts list, or call ConMet Customer Service at 800-547-9473 for assistance. 14. My hub is running very hot. Should I be concerned? Your hub may run up to 150°F above the ambient air temperature. The hub temperature will run a little warmer when new while the bearings are “running in”. Variations in axle load, hub endplay, lubrication level in the hub, and braking events in service will affect the temperature. 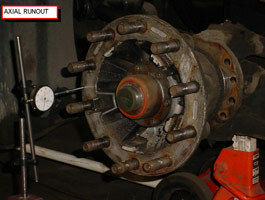 An overheating hub is an indication of a failing bearing, overloading, or heavy braking application. To determine the cause, check the hub after runs without excessive braking or axle loads. A lubricant of appropriate viscosity should be chosen for the hub operating temperature. Improper viscosity may lead to “frosting” or dulling of the bearing surfaces when the lubricant fails to keep the metal surfaces from contacting. This condition will decrease bearing life. 15. Can I convert my hub-piloted hub to a stud-piloted hub? ConMet hub-piloted hubs can be converted to stud-piloted 3⁄4-inch studs, but only if the correct stud is available. Look up your stud part number in the Hub Catalog. A stud chart is also available. Style “5” can be replaced with style “W”. Style “L” can be replaced with style “P”. Dual-wheel applications require a 1.31 to 1.44 inch stud standout from the mounted drum, or from the hub flange for disc brake applications. Super-single or wide-base wheels require a 1.31 minimum stud standout from the mounted drum, or from the hub flange for disc brake applications. Single-wheel applications require a minimum standout of 1.32 inch from the mounted drum, or from the hub flange for disc brake applications for steel wheels and 1.80 inch for aluminum wheels. Please confirm compatibility to your specific hub with our customer service before ordering. Front hubs cannot be converted to 1-1/8 inch studs. Compare the drum pilot diameter on your hub with the pilot diameter needed for the drum you will use. The current standard drum pilot diameter is 8.78 inches. Contact ConMet Customer Service at 800-547-9473, if you require assistance determining the drum pilot diameter on the hub, and for availability of studs. Contact your drum manufacturer for their pilot diameter. If you have an 8-stud hub, there is no conversion, as the stud-piloted hubs only exist with 10 studs. 16. A ConMet representative said I have a “small-backface” hub. What does that mean? A small-backface hub has a flange outer diameter that is slightly smaller than usual. Hubs of this type were made specifically to clear the inside of certain drums that do not meet SAE J1671 recommendations. Most drums do not require this special modification. 17. Can I convert from dual wheels to a super-single (wide-base) wheel? Yes, but there are several considerations: The required stud length may be different. For hub-piloted applications using 22mm 2-piece flange nuts, a minimum length is required for proper thread engagement to the nut. All ConMet trailer and drive axle hubs designed for dual wheel applications can be used with wide-base wheels. This assumes a 1/2″ brake drum thickness, 1.13″ wheel disc thickness and a 1.19″ nut height, giving a minimum required stud standout of 2.94 inches from the hub flange. A longer stud, while affecting appearance and socket fit, is also acceptable. Some available nuts include: Metform 39627 (1.06″ height) and Hayes Lemmerz 90846 (1.19″ height). For stud-piloted applications on drive and trailer hubs: All ConMet trailer and drive axle hubs designed for dual wheel applications can be used with wide-base wheels. Standard ball seat cap nuts for single or outer dual applications can be used for steel wheels. The thread size is ¾”-16. For aluminum wide-base wheels, ConMet recommends Alcoa 5995R/L cap nuts, or equivalents, which have been engineered to fit wide-base wheels. 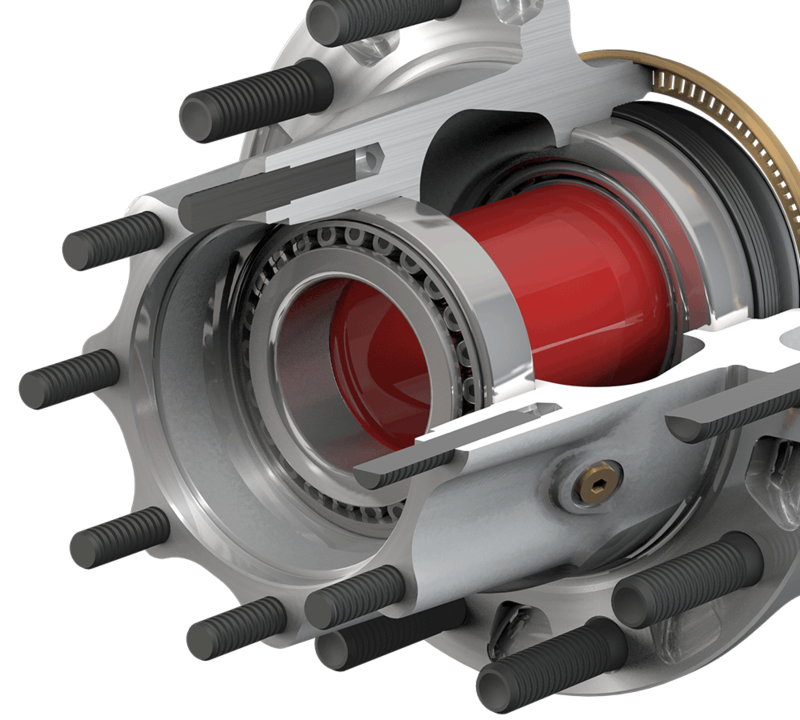 For super-single (wide-base) wheels on drive and trailer hubs the hub will be derated for load for wheels over 1″ offset. See ConMet Technology Bulletin 10009934 “Wheel End Load Ratings for Hubs Used in Single Tire Applications” for further details. IMPORTANT: Outset wheel may decrease the load rating for other components such as axles and bearings. Manufacturers of those components should be consulted for approved load ratings. Many manufacturers of axles wheel end components recommend that the P type spindle be used in conjunction with outset wheels. 18. Is my spindle nut compatible with your PreSet hub? PreSet hubs require a minimum spindle nut torque with increasing torque as necessary to advance to the next locking interval. ConMet does not specify or recommend specific spindle nuts for PreSet hubs. The nut manufacturer should be consulted to verify the nut can withstand the specified torque with any required advancement. Note: ConMet PreSet Plus nuts should not be used with PreSet hubs as bore clearance is not guaranteed. Nut kits for PreSet Plus hubs are listed in the Service Manual. 19. I replaced a competitor’s hub and now the ABS bushing interferes with your hub. How can it be fixed? The bushing can be tapped back using a soft-faced mallet. It will then clear the hub. 20. Why do wheel studs break? The cause of wheel stud fractures is almost always incorrect tension of the stud, either too high or too low. Low tension will cause the clamped parts to slip and load the stud in shear. High tension will lower the fatigue life of the stud and it may weaken the stud by causing yielding and necking. ConMet wheel studs meet or exceed SAE grade 8 specifications and should not fail when proper tension is maintained. Initial tension is set with 450 to 500 ft*lb of torque on properly lubricated wheel nuts. This tension may relax over time if any material in the clamped zone permanently deforms or yields, if dirt or other contaminants are present, or if the vehicle is overloaded. See ConMet service manual 10041406 for details on how to set and maintain proper stud tension. 21. What is the part number of my hub? Identifying ConMet hubs is detailed in ConMet service manual 10041406. Typical numbers available for identification include a casting number, machining number, and assembly number. 22. I can’t find replacement bearings for my PreSet hub. What do I do? ConMet’s PreSet and PreSet Plus line of hubs use specially-toleranced bearings having tighter tolerances than industry-standard bearings. That aside, they are interchangeable with industry standard bearings. The bearings can be found in ConMet hub rebuild kits and bearing sets listed in the back of our service manual 10041406. Additionally, If necessary, industry standard cups or cones can be used, but the hub must be converted to a manual-set bearing configuration by removing the bearing spacer and setting the bearings manually. The hub can be converted back once the proper bearing is obtained and installed. Contact Customer Service at 800-547-9473 for the correct standard bearing numbers if necessary. 23. There is rust all over my spindle, and the hub was difficult to remove. What can I do about it? Aside from outside contamination, this is normal fretting corrosion and is related to the small movements of the bearing against the spindle in service. The effect of fretting can be greatly reduced by applying a coating of grade 2 grease to the spindle bearing journals before installing the hub. In severe cases, the bearing cones will adhere to the spindle and require a special tool to remove the hub. The spindle can be reconditioned with emery cloth or a fine sand paper to remove the excess rust before installing the hub. Consult your tractor or trailer OEM, or the axle manufacturer in cases of severe spindle damage. For more information, refer to the Field Service Bulletin entitled “Removing Frozen Hubs from the Spindle”. 24. Someone told me I can’t service the special bearings in your PreSet hub. Is this true? No. PreSet and PreSet Plus hubs are fully serviceable and rebuildable. ConMet’s FAQ 22. 25. My drum pilot is damaged. How did that happen? A damaged drum pilot is usually caused by installation damage, where wheel studs are torqued with an unseated drum. The drum is not allowed to rise over the pilot and slides into it, destroying the pilot surface. This can be prevented using proper installation techniques described in ConMet service manuals: One pilot aligned on top of the hub, tighten the top wheel nut first to seat the drum. Pilot damage can also occur when the drum or wheels slip in service, as allowed by insufficient wheel nut torque. 26. What hubcap should I use? PreSet and PreSet Plus hubs must use an approved PreSet hubcap to maintain warranty. The back of our service manual 10041406 contains a list of approved hubcaps. For PreSet front hubs, refer to your OEM tractor manufacturer for requirements. ConMet does not specify hubcaps for Non-PreSet hubs or for wheel ends configured with an automatic tire inflation system. For non-PreSet hubs and tire inflation systems, refer to your OEM for requirements. 27. Do I have to replace the PreSet spacer when I service the hub? The PreSet spacer is reusable. It does not crush or deform in normal service. However, if damage or wear is detected during recommended service, replace it. Wear to the spacer can appear as a sharp ring of standing metal at either edge of the machined surfaces (see images below). Contact ConMet Customer Service at 800-547-9473, for a replacement. Spacer part numbers are listed in the Service Manual. 28. I’m using a wide-base tire and wheel on my drive or trailer axle. Does that affect my hub load rating? Yes. For super-single (wide-base) wheels on drive and trailer hubs the hub will be derated for wheels over 1.13″ outset or inset. See ConMet Technology Bulletin 10009934 “Wheel End Load Ratings for Hubs Used in Single Tire Applications” for further details. IMPORTANT: Outset or inset wheels may decrease the load rating for other components such as axles and bearings. Manufacturers of those components should be consulted for approved load ratings. Many manufacturers of axles and wheel end components recommend that the P type spindle be used in conjunction with outset wheels. 29. Where do I find parts for my hub assembly? For a list of ConMet Hub Parts Suppliers in your area call ConMet Customer Service at 800-547-9473, or visit the Sales and Service section of our web site. 30. What is the warranty for ConMet hubs and what is covered? Please refer to the ConMet Hub Warranty. 31. Where can I get more information? Call ConMet Customer Service at 800-547-9473, or browse our Hub Literature Section. 32. Will a ConMet wheel stud or axle stud fit my non-ConMet hub? Can I use a ConMet fastener in my design? No. ConMet studs are designed for use only in ConMet hubs and should not be used in any other brand of product. Aftermarket sales of ConMet studs is intended for replacement of parts in service. Hardware for general use should be obtained from aftermarket stud manufacturers. 33. I'm experiencing vibration and/or tire wear. How much runout is allowed on my hub? 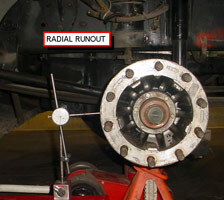 Up to .008 inch axial and radial flange runout is allowed relative to the axle. The wheel and drum pilots can be confirmed by measuring the outer flange since they are machined at the same time. During measurement the bearings must be set with zero endplay. The PreSet ® or LMS™ spacer between the bearings, if one is present, must be removed to accomplish this. Take care not to misalign the seal when the outer bearing cone is removed to access the spacer. Apply light torque to the spindle nut while rotating the hub to assure there is no endplay. When measuring radial runout, take readings between the wheel studs, as there will be a slight bulge in the flange near the studs. Make sure all surfaces are clean and in good, undamaged condition, or the resulting value could be in error. The gage should be mounted rigid relative to the spindle or to ground (See images). Hubs returned for warranty consideration with excessive runout from a manufacturing defect will be honored if the runout is verified to exceed .008 inch. 34. How much runout is allowed on my ConMet hub and drum assembly? The value, when measured radially at the inboard drum braking surface, will vary depending on the specific drum size and hub. A good rule of thumb is to allow up to .020 inch with the drum mounted to a hub on a vehicle. Many factors contribute to this value, including runouts of the bearings, hub, and drum and hub endplay. Sometimes, removing and rotating the drum can improve the runout as the component runouts cancel each other out. Marking the hub and drum can assure the same optimum position is maintained when the drum is installed again. 35. I think my hub has a crack. What should I do? Hub cracks are not common but possible. Your hub may have a raised surface which appears to be a crack but is actually a feature formed from a crack in our mold used in the process of forming the hub. Molten metal fills these mold cracks during the casting process, creating a raised surface. They will not leak and will not show evidence of red or black oxide. These raised surfaces are normal casting variations. If you suspect your hub is actually cracked, replace the hub assembly immediately. 36. Is my new hubcap vent plugged? All ConMet hubcaps have vents containing a sintered metal filter. This filter should not be removed or contamination will be allowed to flow through the open hole. The filters are designed to allow air to flow through the vent.